Male Boss Giving Instructions To His Female Secretary In Luxury Jet. Young female assistant getting instructions from her male boss in luxury jet. Beautiful secretary with red hair sitting on leather sofa near businessman, who is gesticulating, and taking notes. Hands of male boss and female secretary working together in business jet. Young lady in white shirt taking notes in notebook, sitting opposite to businessman in black suit, who is holding mobile phone in his hands and giving instructions. 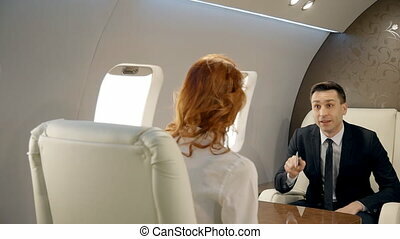 Male and female business partners having negotiations in luxury jet. Woman with red hair and man in black suit with mobile phone in his hand sitting on comfortable seats opposite to each other and discussing their business strategy. Male and female lawers talking in private jet. Man in suit and woman with red hair having business trip. Professionals sitting on the withe leather sofa and discussing their strategy. Young female intern with red hair showing financial graphs to her male boss in suit walking through the corridor. Male and female busines lawyer partners talk and working in private jet. chief Businesswoman with red hair coming to comfortable chair and taking a seat and businessman in expensive suit smiling at talking to her in luxury plane. Businessman in suit telling a story to his female colleague with red hair drinking coffee at the counter in the office. Indoors. Businessman chief instructing young lawyer female intern in private jet. Male boss in black suit sitting on confortable seat, talk and gesticulating actively. Woman with red hair, in white shirt taking notes on sofa opposite to him. Male financial analytic in suit is discussing financial graphs with his red hair female colleague sitting at the office table. Indoors. Young successful businessman and female employee working in private jet during flight, elegant boss wearing suit is talking, red haired woman is taking notes, sitting in modern interior. Concept: work together, business trip, lifestyle. Male chief and female crypto busines partners talk discussing their strategy in the plane. Businessman in black suit and lawyer businesswoman with red hait sitting opposite to each other at the table in private jet and talking. Businessman having mobile phone conversation in luxury private aircraft. 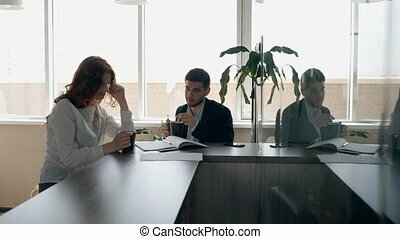 Successful man in black suit with tie sitting in comfortable seat, looking to the window and discussing business plans with his partners, using brand-new smartphone. Portrait. Successful businessman researching financial graphs and his secretary with red hair typing messages on her smartphone in the office. Indoors. Young businessman is talking with female employee sitting in private airplane, stylish man in suit with tie is in business dialogue with red haired woman during business trip in luxury interior. Concept: businesspeople, conversation, aircraft.